The fascination with things being made by hand is odd. If I sew a button on by hand, chances are it will be done worse and not last as long as the best machine doing it. This is firstly because I am not very good at sewing on buttons; but secondly and more importantly, it is because a machine will sew more stitches to the inch, so it will be stronger. Purchasers of fine clothes should ask themselves, when presented with something made by hand, whether that is necessarily an advantage. Seams that come under a lot of strain usually need to be strong above all else. The advantages of handmade construction are flexibility, movement and life; it adds stretch to the shoulder seam of a jacket and personality to the padding of its chest. But it is not always and necessarily better. Equally, ask yourself whether the marginal difference made by hand construction is worth the money. I know that my tailor, for example, uses pre-made shoulder pads. Some of the Savile Row tailors make their own, by hand. Personally it’s something I am quite willing to save on. But I want to pay to have the chest made by hand. I have also never understood people that want something to be flawed to prove that it is handmade – fluctuation in the hand-stitched lapel or a slight skew in the welt. To them imperfection is honesty. To me it is a fault. I want my individuality in the fit, the design and the wear. I don’t want to see evidence of the craft; I just want to benefit from it. It’s true that no two items made by hand will ever be identical. As a bespoke shoemaker told me once “if I ever punched two medallions exactly the same I wouldn’t be a craftsman, I’d be a robot.” But, contrary to him, I don’t see a virtue in the slight looseness of one seam on a shoe’s counter. It bugs me and I want it changed. The fact that he has lasted the shoe by hand is not something that can be seen. Its virtue is that he was able to adapt the natural leather and its personality when stretching it over the last. The attention to detail means it will wear better. That’s the kind of hand construction I want. You can follow the discussion on Buy handmade when it’s worth it by entering your email address in the box below. You will then receive an email every time a new comment is added. These will also contain a link to a page where you can stop the alerts, and remove all of your related data from the site. It’s a good point. I’ve never quite understood the obsession with hand-made for hand-made’s sake. As you say, some things a craftsman can do better by hand, and in other areas he will never be able to match the precision and reliability of a machine. A mix of both skills, chosen intelligently, is the way to get really great quality clothing. Obsessing over having everything hand-made is the way to get really expensive clothing. Simon, I can’t resist, this is really a debate to get stuck into! It’s also something that has come up as part of Walpole’s ‘crafted’ programme debates(flying the flag for young British luxury goods businesses). and would say that any craftsman worth his salt would cringe at the idea of a wobbly welt equalling handmade. Handsewn shoemaking has a minimum three year apprenticeship. Even after over ten years making we are by no means perfect – the robot metaphore is true – but we aim to be excellent. I agree, where hand made should show is in the selection and cut of the leather for the uppers, so it gives/is taught where it needs to be; and in the fit of the upper – a hand lasted shoe is ALWAYS tighter than machine lasted… so excellent for the individual fit of handsewn bespoke; in the quality of the materials, the styling of the pattern, the stitching of the upper and in the finishing. I would argue that it IS also in the strength of the stitching. 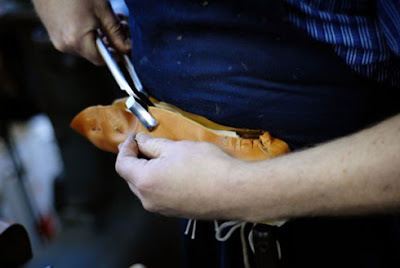 A handsewn shoe (as opposed to hand made – as you know, two VERY different things) has the strongest foundation with two stages of stitching – the welt and the sole – through what is effectively two full thicknesses of cow hide. It can be easily replaced, repaired and remade. Now that isn’t that hand made worth paying for? Where tailored clothing is concerned, I happen to agree with you to a point; many steps in the crafting of a garment can be done by modern machinery to the same or better level of quality as is achieved by hand. Many steps, however, can not, but it is a nuanced and complex thing; rather than trying to explain the difference, it is easier to sell the consumer on the idea that a fully hand-crafted garment is somehow superior. In the sense that a machine-made reproduction of a painting does not have the same allure as a hand-painted one, this may be true. But from a purely technical standpoint, it is not. But how is the consumer to know? The consumer has no choice but trust the very people who are selling them their goods, and in the case of certain houses who claim that their garment is superior due to the hand-sewing involved, it is difficult to assume otherwise. Sadly, it seems that the claims made by certain makers are not always entirely true where hand work is concerned. So whether or not a garment is better when made by hand is the subject of one debate. Just how much handwork was actually involved in making that garment is, apparently, another. This smacks of a point made for pointing, an argument for arguing etc. Think about what you’re paying for. Think about who’s hand did the making. It’s not really news is it? I can’t remember ever losing a shirt button that was sewn on by hand, while even the more expensive machine-made shirts have a habit of shedding their buttons with ease. I agree with your point and as someone who is training to be one of these craftsmen (I am an apprentice tailor) I can tell you that this is a subject that comes up often with my peers. However I must make a correction about one example you made. When using factory shoulder pads one must design the shape of the armhole to match the chosen pad. However when a tailor makes the pads himself the pattern piece for the pad if made to fit the armhole and therefore there are no design or fit compromises. As well when the customer has uneven slants in his shoulders making the pads can often be the best method for guarantying that the jacket rests evenly on him. This is not to say that your point about the cost benefit analysis is not valid it is just to say that there is an actual point to handcrafting shoulder pads where as there is no real advantage to hand sewn buttonholes other than that hand crafted look. That’s a good point and an interesting insight, thank you Aaron.